The latest G-Shock leak making the rounds online is what appears to be a new Love The Sea And The Earth collaboration with I.C.E.R.C. (International Cetacean Education Research Center). The G-Shock Frogman GF-8251K-7JR and G-Shock GW-6903K-7JR feature an ocean-inspired motif with transparent bezels and bands and blue inner cases. 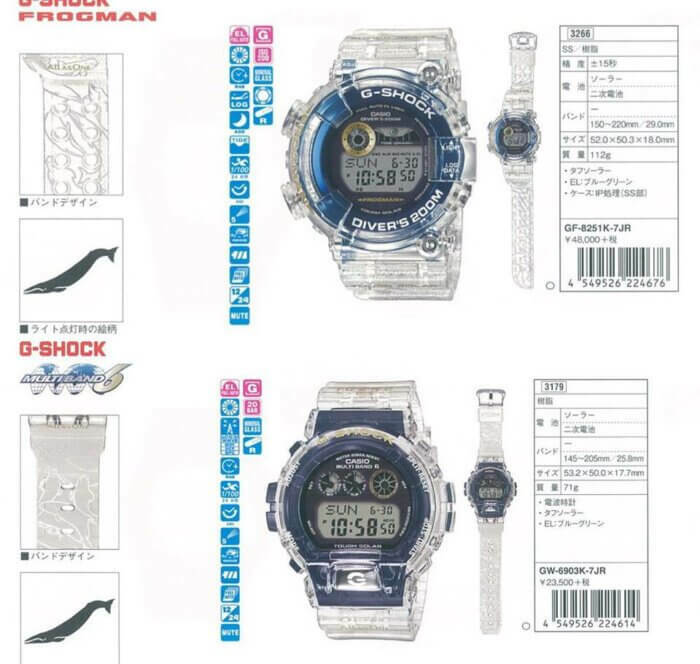 The stainless steel inner case of the GF-8251K-7 Frogman appears to have a blue ion plating and the GW-6903K-7 appears to have an inner case made of blue resin. The watch bands of both models display a special pattern depicting the silhouettes of whales and dolphins. According to Zona Casio, this pattern on the GF-8251K-7 is textured into the band’s surface which is a very unique element for a G-Shock and perhaps especially so for a jelly model. The pattern on the GW-6903K-7 is printed on the band. The GF-8251K-7 has white bezel lettering and the GW-6903K-7 has a gold G-Shock logo. These watches are also expected to have custom case backs and EL backlights. The GF-8251K-7 is a more affordable Frogman model (compared to the GWF-D1000) and features Tough Solar power and a tide and moon graph. Like all Frogman watches, it has ISO 200M water resistance, a stainless steel case, and a screw-lock case back. The GW-6903K-7 is modeled after the iconic DW-6900 case from the 1990s and features Tough Solar power and Multi-Band 6 automatic radio time-sync. The GF-8251K-7JR and GW-6903K-7JR are expected to be released in Japan in June 2019 with a list price of 48,000 JPY and 23,500 JPY, respectively. This post will be updated when more information and photos are available.